May 2013 sees the 70th anniversary of the Battle of the Atlantic. Numerous events are planned in London between 8th and 12th May, in Londonderry on 11th and 12th May and in Liverpool between 25th and 27th May. On behalf of all members it is planned that Brian Cotton, Tony Selman and WW2 veteran Frank Kelley will attend the memorial service at St Paul’s Cathedral on 8th May and the MN Memorial Service in Trinity House Gardens on 11th May. Brian and Tony will also attend the Service of Commemoration at Liverpool Cathedral on 26th May where we will be accompanied by WW2 veteran Albert Owings. Other events may be added if tickets are forthcoming. If it is possible to do so we will present wreaths wherever we can to pay respects to our fallen colleagues. A total of 1,294 R/O’s lost their lives in WW2, many of them in the Battle of the Atlantic. As a sign of our respect the ROA will place a full page commemoration in the memorial programme the text of which is shown below. I cannot import the artwork design of the advert on to the website so I have mocked it up as best I can. “The Radio Officers’ Association (ROA) is proud to be associated with the events commemorating the 70th anniversary of the Battle of the Atlantic. The Merchant Navy was at the forefront in all the armed conflicts of the twentieth century and is sometimes referred to as the fourth arm in the defence of the nation. In those conflicts many Radio Officers performed extraordinary acts of bravery and self-sacrifice. It is of no surprise that in World War 2, of the 30,000 casualties suffered by the British Merchant Navy, no less than 10% were Radio Officers and Masters. Often the Radio Room was the first target of shelling by enemy raiders to silence the distress calls. 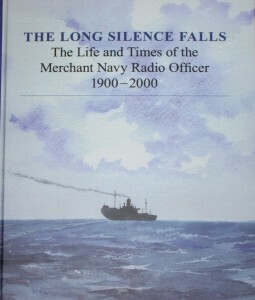 Many Radio Officers died as they remained at their posts to the last, transmitting the vital distress message that their ship had been attacked, although by tradition the Master was the last to leave the sinking ship. We salute them all. In particular we pay our respects to the 1,294 British, Irish and Commonwealth Radio Officers who lost their lives in World War 2. Not all of these were lost in the Battle of the Atlantic, but many were. The ROA website (www.radioofficers.com) contains an ‘In Memoriam’ section where details of all Radio Officers who lost their lives are given in as much detail as can be ascertained. The public are most welcome to use this as a source of information and the Association welcomes corrections and additions.